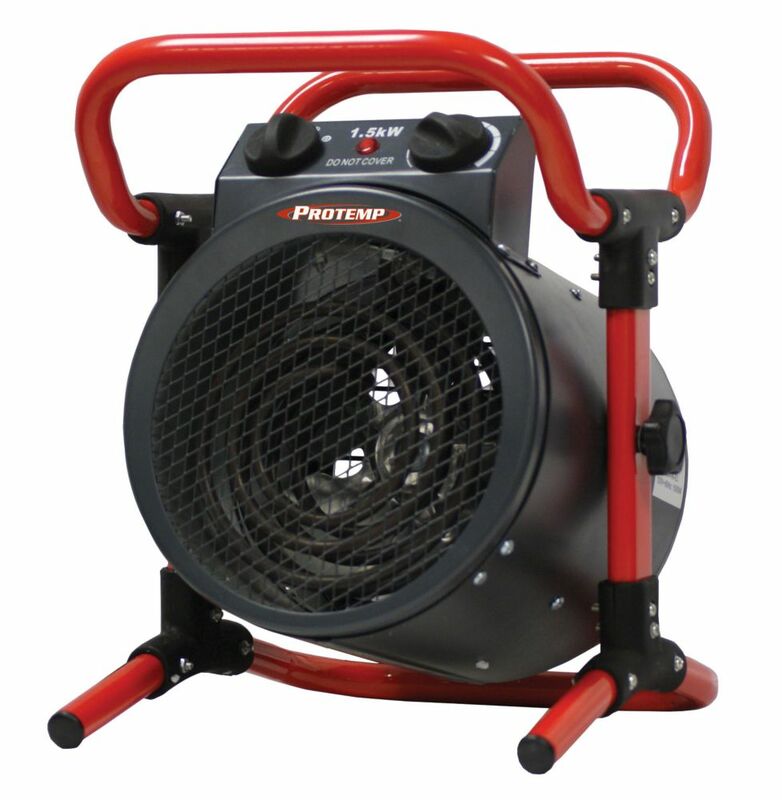 This ProTemp Electric Turbo Heater is rugged built and produces up to 5,100 BTU of warmth, making it ideal for garages, workshops and jobsites. Stainless steel heating element Heats up to 165 square feet - Built-in thermostat control. DEWALT<sup></sup> industrial electric forced air heaters, are construction-grade quality built for the Canadian winter. They can be operated unattended, include an adjustable thermostat and made with heavy-duty durability. They're typically used in high rise construction sites, job sites and metropolitan construction areas. CSA approved, and tested on the jobsite, they're Guaranteed Tough. 1,500 Watt / 5,100 BTU Industrial Electric Heater This ProTemp Electric Turbo Heater is rugged built and produces up to 5,100 BTU of warmth, making it ideal for garages, workshops and jobsites. Stainless steel heating element Heats up to 165 square feet - Built-in thermostat control. 1,500 Watt / 5,100 BTU Industrial Electric Heater is rated 1.8 out of 5 by 4. Rated 1 out of 5 by Construction from Looks heavy duty but you get only heavy, no duty.! I bought this for my job site, small room so guys can warm up little bit and have their lunch in a let say not cold room. This heater has a fan three times bigger and ceramic coil is poor quality. Result is blowing almost cold air. One of the workers brought small $24 heater and that heater (it’s not a joke) heats at least 5 times better than this one. Rated 1 out of 5 by Big Al from Limited Uses ProTemp 1500 Watt electric heater is functional in very limited uses considering the 1.5 KW potential output. The heater is coupled with a very small air flow fan that struggles to operate in a cold environment. Rated 1 out of 5 by Ken79 from Not worth it Did not put out heat like advertised. Bought a different unit for 40 dollars less and it put out twice as much heat. Lost the recite or I would have returned it. Rated 4 out of 5 by KEVE from Not a bad product The physical design is quite good. It puts out as much heat as one could expect from 1500 watts. Has a function for fan only or fan plus heat on a thermostat, although the fan will run continuously in this mode and only the heat cycles around the thermostat. It's too bad that the fan does not shut down when the heater element turns off as I suspect that the life of the fan will determine the life of the entire unit. Not bad for a big box store item and fairly construction. What kind of an electrical outlet is needed for this heater? Will a regular 15 amp socket work?? Yes. It will run on a 110volt 10 amp circuit minimum although there had better be no other load on the circuit. What is the power source 120v ? 240v? &nbsp;Other? It's 120v. &nbsp;The 120 in the model number indicates the operating voltage. Also google the model number to confirm.